Practical, straightforward, and affordable, this guide gives middle and secondary school teachers the tools they need to support their students’ comprehension and success in literacy and in content area learning. The classroom-proven strategies and procedures included are taken from the authors’ and their colleagues’ experience in middle and secondary classrooms. Each chapter opens with a vignette from an actual classroom to show readers effective teaching in action and to give them a look at how the chapter’s instructional approach works within content area teaching. Research-based rationales for each strategy follow the vignettes and provide an in-depth look at how to implement the strategy, along with examples of each strategy across the curriculum. The Enhanced Pearson eText features embedded video and assessments. Douglas Fisher, Ph.D., is Professor of Educational Leadership at San Diego State University and a teacher leader at Health Sciences High & Middle College having been an early intervention teacher and elementary school educator. He is the recipient of an International Reading Association Celebrate Literacy Award, the Farmer award for excellence in writing from the National Council of Teachers of English, as well as a Christa McAuliffe award for excellence in teacher education. He has published numerous articles on reading and literacy, differentiated instruction, and curriculum design as well as books, such as Better Learning Through Structured Teaching, Rigorous Reading, and Text Complexity: Raising Rigor in Reading. Nancy Frey, Ph.D., is a Professor of Literacy in the Department of Educational Leadership at San Diego State University. She is the recipient of the 2008 Early Career Achievement Award from the National Reading Conference. 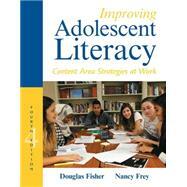 Nancy has published in The Reading Teacher, Journal of Adolescent and Adult Literacy, English Journal, Voices in the Middle, Middle School Journal, Remedial and Special Education, TESOL Journal, Journal of Learning Disabilities, Early Childhood Education Journal, and Educational Leadership. She has co-authored (with Doug Fisher) books on formative assessment (Checking for Understanding and Formative Assessment Action Plan), instructional design (Better Learning for Structured Teaching), data-driven instruction (Using Data to Focus Instructional Improvement), and brain-based learning (In a Reading State of Mind.) Nancy is a credentialed special educator, reading specialist, and administrator in California, and has taught at the elementary, middle, and high school levels for two decades. She is a teacher-leader at Health Sciences High and Middle College, where she learns from her colleagues and students every day.